Our backyard is a 120 acre lagoon, connected to, but sheltered from, the Pacific Ocean. The lagoon is designated a Migratory Bird Sanctuary and is ideal for safe canoeing, row-boating and kayaking; boats and mountain bikes supplied free of charge. We are surrounded by the Historic Fort Rodd Hill, the 1860 Fisgard Lighthouse and the Hatley Castle & Gardens. All of this is nestled amidst 600 acres of old growth forest and accessible by walking / hiking, canoeing, kayaking or cycling from our doorstep. Free use of our private dock, courtesy boats and mountain bikes are also included. Mile after mile of west coast beaches and hiking trails are set against the back drop of the snow-capped Olympic Mountains which tower over the shipping lanes of the Strait of Juan de Fuca. Our fabulous, intimate 1897 heritage Bed & Breakfast Inn offers the ultimate in luxury, romance and relaxation. Ambrosia is located right in the heart of Victoria�s downtown, just three short blocks to the inner harbour, and one block to Beacon Hill Park. Conveniently located in downtown Victoria - in the shadow of Craigdarroch Castle - on a quiet tree-lined lane in Rockland - a prestigious neighbourhood of Victoria. Modern West Coast custom design featuring five levels, a two story glass-covered foyer and views of maples, cedars, oaks and gardens from every window. Our spacious guest rooms are beautifully decorated and offer queen-sized beds, en-suite private bathrooms, TV/VCR, and other amenities. Our Garden room even has a wood-burning fireplace to enhance an already romantic setting. Fairholme Manor is a beautifully restored 1885 Italianate mansion located next to the gardens of Government House in the prestigious Rockland area of Victoria, close to ocean, downtown attractions, inner harbour, and US ferries. Overlooking beautiful gardens in a quiet one acre park like setting, the Fairholme offers full amenities (TV/VCR/CD/TEL) in six private, spacious suites, some with private balconies, fireplaces, double Jacuzzis or double soaker tubs and queen or king size beds. Enjoy the splendid scenery that Victoria is famous for with spectacular ocean and mountain views. 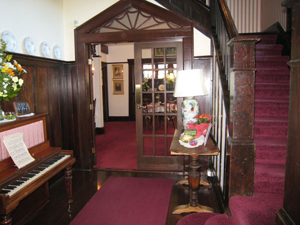 The Oak Bay Bed and Breakfast Guest House is a gracious old Victorian home built in 1912. 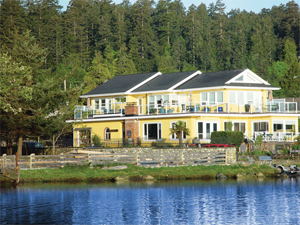 Easily one of the oldest continuously operating B&Bs in Victoria and possibly British Columbia. Guests have been returning since 1942. Eleven guestrooms and two sitting rooms provide the most gracious of settings for your getaway and the lower Fireplace lounge with its Inglenook Fireplace provides a cosy spot for easy relaxation. You'll never want to leave.